Sheer joy was had last night when I arrived home from the gym to find my new tennis shoes had arrived! I know they say a good tennis shoe makes all the difference but seriously, that is no lie! I could literally feel how better my foot fit into these guys the second I put them on. If feet could sing, I'm pretty sure mine would be belting the Hallelujah chorus. Again, sorry for the quality of the pic - someone was too lazy to get her regular camera out. These shoes are heaven. They're so light. So goodbye crappy Nikes. While I'm thankful for the hundreds of miles we've pounded out, I'm looking forward to no more blisters and bruised toes! I can't wait for Saturday to come so I can go for a run. Like, seriously Cannot. Wait! I may or may not have even worn these with my pajamas around the house for a couple minutes hours last night. It was HOT! Happy Wednesday Lovies! Tell me something funny about your week! haha love it! girls love their new shoes! :) But really there's nothin better than a comfy pair of sneaks. Love them! I totally agree with you, Nikes...UGH!!!!! Hate them!! haha - i do love a new pair of running shoes! loving this pair! i dont blame you for wearing them around the house. haha. new shoes make such a difference! happy running!! Nice kicks! I really need to get back into running. I desperately need new running shoes! Where did you get yours from? I love New Balance so that's what kind I wanted to look at! ahh i love the feeling of a new pair of running shoes! i wish it wasn't so dang cold up here so i could go for a run outside! i'm ready for spring already. I agree! shoes can sometimes MAKE the run! =) enjoy!! Hahaha, that's so funny that you wore them around with pajamas! I like them...enjoy your run! love them!! 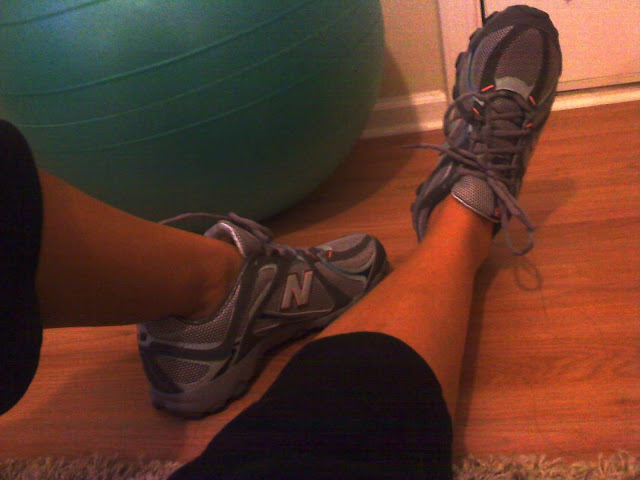 i have a few new balances (two to be exact) and they are super comfy for running!! Love them. Let me know how you like them. I'm in desperate need for a new pair of sneaks. looove those. gray sneaks are the best. Guess just keep at it? hey! thanks for your comments! yes, i am currently training for the Disney Princess Half Marathon, this will be my first! I am really excited!